Dlores Buljevic, USDA EAS, talked about how their mission is to enable Web GIS, applying geography to everything that involves location. Web GIS transforms GIS into a platform, and allows the understanding of your data through useful apps. Implementing GIS involves understanding the purpose of who you are trying to serve, said Buljevic. Leveraging the capability and capacity of private industry mapping firms. Achieve a 25% cost efficiency gain by collecting data in larger projects. Completely refresh national elevation data holdings with new lidar and ifSAR elevation data products and services. 3.4% of entire U.S. was acquired to 3DEP quality in FY15, 13.9% of lower 49 states meets 3DEP quality (2008-2015 only), 63.6% of AK meets 3DEP quality (QL5-ifsar). From September 9th – September 16th, 2013, Colorado experienced one of its most extreme rainfall and flood events in recorded history. The flooding spanned several counties, and resulted in 5 known dead, hundreds unaccounted for, 17,000 homes flooded, 12,000 evacuated from the area, 1,500 homes destroyed, extensive damage to transportation infrastructure, and many large communities isolated as a result of downed bridges and lost roads. Emergency Watershed Protection (EWP) specialists found there was no centralized depository for all the data, it was labor intensive to upload and download to and from iPads on a daily basis, some data collected was not useful and inconsistent, and it would have been useful to identify the data needs of the engineers at the initial damage site visits. 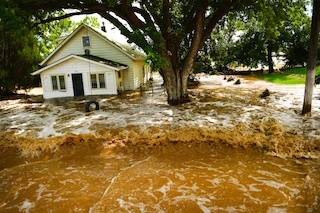 The 2013 Colorado Flood EWP Phase 2 plan was enacted in February 2015 (After Action Review of Phase 1) for coordinated data collection, and data management and decrease the number of times data needed to be input into a form (using cell phone coverage). In March 2015 Colorado received $56 million to implement Phase 2. In May 2015, Colorado NCRS organized the Get it Done Team. 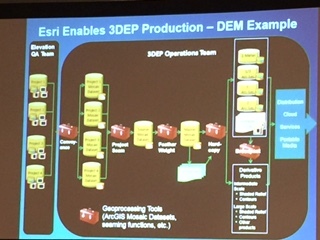 Their established goal was to develop a process to efficiently complete Damage Survey Reports (DSRs) for EWP P2 which incorporates lessons learned. They used Sharepoint to get access to information as it arrived from the field from specialists. They will continue to use their iPads, automate forms, and the GAIA program. 40 detailed NRCS engineers from around the country utilized iPads for getting to the site and for more in depth data collection, as well as setting and finding control survey points. Going forward they will also put Esri Collector on the device that can be used you can disconnected where there is no cell coverage. This entry was posted on Saturday, April 2nd, 2016 at 11:28 am. You can follow any responses to this entry through the RSS 2.0 feed. You can leave a response, or trackback from your own site.